It is a common knowledge to everyone that most tattoos come with meanings in them. Tattoos are permanent so if someone would decide to get one, it should be something that they will treasure forever or something that has a significant meaning in their life. One of the most common tattoos that you will find on men is the skull. Generally, skulls are used to represent death and in fact, people associate it to something scary which is why you often see them on a scene in a horror movie. But skull tattoos mean a lot of things. For others, it represents protection, power and strength. Some people would also see it as a sign of overcoming obstacles. 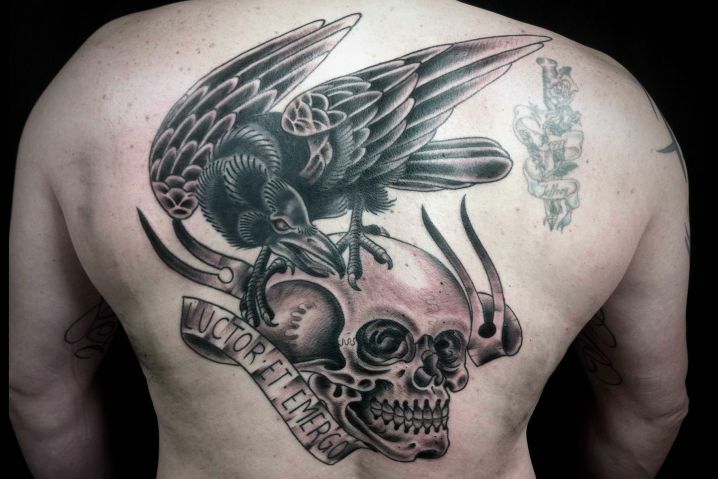 Here are the top 20 skull tattoo ideas for men. A raven tattoo is said to depict protection, intelligence and death. So it seems that they have similar meanings with a skull tattoo and therefore, both will pretty much blend well with each other. In this tattoo however, you will find a short quote that says “luctor et emergo” a popular Dutch motto that means “I struggle and emerge”. Thus, it can be concluded that the skull signifies “the struggle” which the raven has finally defeated.